Each demographic topic in your Reports can be switched to show the most relevant variable for you on the card. 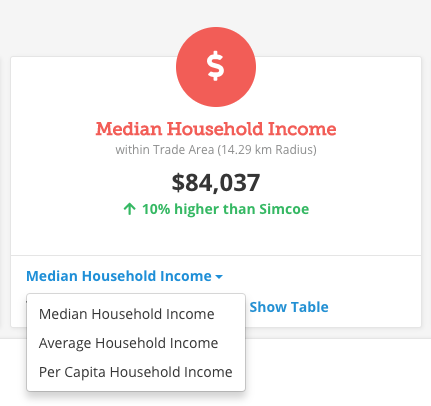 For example, by default, PiinPoint reports show Median Income, but now if you want to show Average Income or Income per Capita, you can. Simply select the dropdown and switch out the variable you'd like to show. Shared versions of reports will maintain whatever selection you picked. You can learn more about customizing and editing reports in our docs here. When producing a thematic map, you now have the ability to select from six different color schemes, depending on what's most applicable to the variable you're displaying. Learn more about the target market heatmap in our docs here. If you remove the border altogether, you won't be able to toggle the fill of the shape. Still have questions about these updates? Let your Customer Success team know via the chat or email support@piinpoint.com.